Before joining LSBU, Daniela worked at the London School of Economics and Political Science, University College London, and Royal Holloway, where she completed her PhD on the socioeconomic dimension of transitional justice in post-war Bosnia and Herzegovina. Daniela’s research focuses on transitional justice and peacebuilding, post-conflict reconstruction and the political economy of post-war countries. Her research contributes to current debates on the socioeconomic dimension of transitional justice, and on alternative models for dealing with the past, including transformative justice. Daniela also studies the link between protest movements and processes of dealing with the past. Her main geographical area of expertise is South East Europe and the former Yugoslavia, with an emphasis on Bosnia and Herzegovina. Daniela contributes to teaching a number of modules in the undergraduate course in International Relations at LSBU. While working at Royal Holloway, UCL, and LSE, Daniela has taught a number of modules in the areas of International Relations, research methods, and human rights. She has extensive experience supervising dissertation projects at undergraduate and postgraduate level. In 2016 she was awarded a Royal Holloway Team Teaching Prize for organising and carrying out a survey experiment on the refugee crisis with first-year students taking a research methods class. Daniela’s research addresses the question of how post-conflict and ‘transitional’ countries deal with the legacies of wartime violence. She is particularly interested in the role that socioeconomic violence plays in war, and how it affects post-war justice processes and post-war political economies. 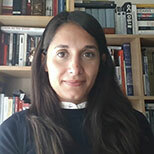 In her research, Daniela combines the analysis of international interventions in conflict and post-conflict contexts, as carried out by states, international organisations, and financial institutions, with the in-depth study of wartime experiences and justice claims from the perspective of conflict-affected communities. She also studies the relationship between social mobilisation and dealing with post-war justice claims. Daniela also writes on gender and post-conflict economies, drawing on feminist perspectives across justice theories and political economy. Daniela is also interested, more broadly, in dealing with the past and the role of the past in International Relations, and in qualitative research and methodology in IR. Daniela has carried out extensive fieldwork in Bosnia and Herzegovina and has an interest in the politics and economics of the former Yugoslav region. Daniela convenes the BISA South East Europe Working Group together with Dr Catherine Baker (University of Hull), Dr Maria Adriana Deiana (Queen’s University Belfast), and Dr Natalie Martin (Nottingham Trent University). The Working Group has organised and funded a series of successful workshops over the past few years, including events at LSE (2017), UCL (2017 & 2016), and at the University of Belgrade in 2017 (in collaboration with the BISA Colonial, Postcolonial and Decolonial Working Group).